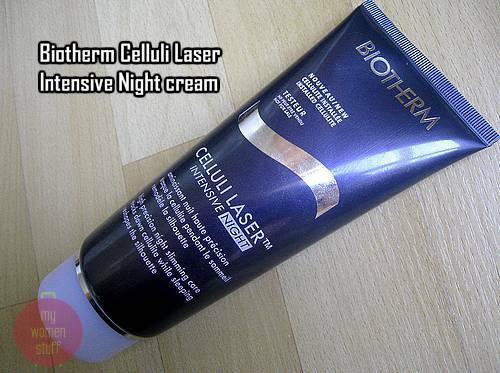 Biotherm has a new product launching in April 2009 – the Biotherm Celluli Laser Intensive Night cream (RM160 for 200ml). Its to complement the existing Biotherm Celluli Laser cream for the day (pink tube). To combat cellulite, one of the main ingredients of the Biotherm Celluli Laser cream is caffeine. Caffeine, if you have read my earlier treatise on the benefits of coffee helps push the water out of fat cells thereby reducing the appearance of cellulite. Biotherm’s Celluli Laser Intensive Night cream is tailored to work while you sleep, which is probably the best time because your body is at rest. I ran into a bit of a problem while test running this cream however. I don’t have an obvious cellulite problem. Yes, I count my lucky stars everyday 😛 So without the problem, I found I cannot quite comment on its cure – sadly enough. But there were some unexpected benefits experienced. I can comment that the Biotherm Celluli Laser Intensive Night leaves my skin feeling and looking smooth – very smooth to the touch! The mint green cream gel texture absorbs very quickly into the skin and I found that after applying, there was shimmer on my hands. Its not that visible on the legs but I am not quite sure why this is so on a product you leave overnight. I can understand if its a cosmetic thing but not in a treatment product. For those of you who are looking for a targeted cellulite buster then you could consider the Biotherm Celluli Laser cream. I’m told that the formula fights the transformation of sugars into fats, fights the trigger of the fat storage process, fights the slowing of drainage mechanisms, stimulates cellular renewal for enhanced receptivity and smooths orange peel skin. Apparently also lots of women agree that it works and women who have been using the day cream are fast fans of it. Reports are that it delivers results (smoother skin and a more defined silhouette) in as little as 10 days but do bear in mind that as with exercise, most of the early loss might just be loss of water. Still, its a start eh? Do you fight an unending battle with cellulite? Have you tried any cellulite creams that work for you? NEXT POST: Dare to flaunt your bra straps! i hate ironing too! hehehe so i dont iron my clothes 😛 just wear blouse to work so crumples aren’t obvious. can’t wait for tmr to come! yeay! So I have tried many different creamsbut none seem to be working. What would you recommend.. and what actually works? I need to see results fast! You can’t get rid of cellulite just lighten its appearance. This cream makes my skin feel very firm and smooth. It might help you.